Is there anything more tranquil than a visit to Ripley’s Aquarium of Canada? In our most recent commercial venture, you’ll have the chance to experience all the marine beauty. The mission was to take a logistically challenging environment (i.e. 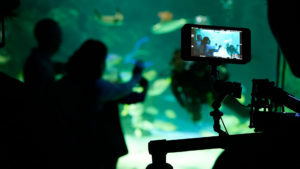 a busy Ripley’s Aquarium) and capture a tranquil moment between a family of four within a 30 second commercial spot. With distribution slated for the Cineplex Pre-Show, we recruited the talented Director/DOP combination of Christian Petrozza and Jack Yan Chen (find links to their work below). You can see our first video with Ripley’s Aquarium Here. With contributions from our partners at Ontario Camera, our equipment included the likes of the Canon C-300MII, the Movi M10 and an EasyRig for increased stability, easy maneuvering and additional camera support. In addition to the 30 second spot, we also took the opportunity to capture a wealth of additional aquarium goodness, including footage from each tank and section within the aquarium. This footage will allow us to showcase the unique design of the attraction and the breathtaking creatures that inhabit it. 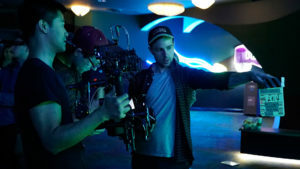 Another big thank you to our friends at Ripley’s Aquarium of Canada and our incredible crew for another fantastic shoot.